Computer notes: A Qt browser for Haiku that actually works quite well. A Qt browser for Haiku that actually works quite well. 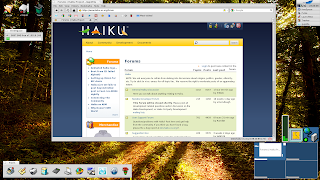 I've posted a lot here about how impressed I am with the Haiku OS project. OK, it's not in the Ubuntu category yet and it's lurching rather than speeding to its first RC. But it does have some tantalizing features that I can't wait to see embodied in a full blown OS. Its greatest feature for me is its speed -- boots for me in 15 seconds on both a Desktop and my netbook. The main thing that's missing right now is an ability to run flash, or H264 videos. Were this available, I don't believe anything else would hold me back from making Haiku my main OS (now it's OS X 10.7.3). OK, so what's this browser I mentioned in the title? It's called Qupzilla and is available from Haikuware. It's still under active development and I've posted some comments on its Haikuware page. Although Qupzilla does still crash now and again, the crash frequency is not such as to dissuade you from using it. It really does seem quite a bit faster than WebPositive, which in itself is a great browser, and I've said many times in this blog that the three things I look for in a browser are speed, then speed and finally speed. I get this from Qupzilla. Additionally, although it has a decent speeddial, I just don't go for speeddial these days. Back in the day when I first saw speeddial in Opera, I was flabbergasted. I thought nothing could ever outdo the speeddial. Then my thinking and needs evolved to going for a favicon filled bookmarks bar. Yes, no words, just favicons. On my MacBook, in Chrome Canary, I can fit more than 40 favicons in the bookmarks bar which presents me with a long list of my favorite webpages just waiting to be clicked. I don't need to move to the speeddial page first as everything is there right in front of me. Now, this great option is available in Haiku courtesy of Qupzilla. See the screenshot. Incidentally, I'm using Qupzilla 1.1.8 on Haiku r43840 gcc2 hybrid with Qt 4.8.0 (min).